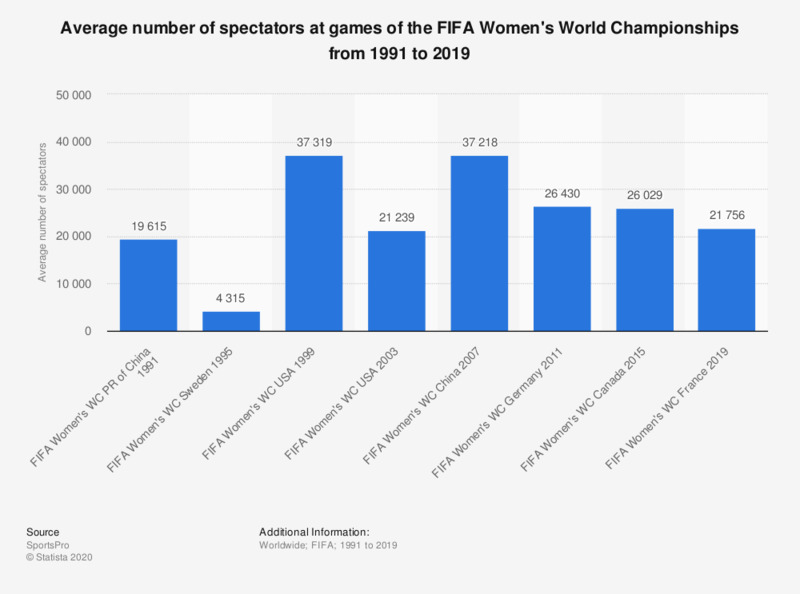 This statistic reflects the average number of spectators at games of the FIFA Women's World Cups since 1991. At the World Cup in 1999 in the U.S. the average game attendance was 37,319. According to historical documents, the first recorded soccer games (known mostly as “football” outside the United States) played by women took place in the late 1890s in Scotland and England. Due to women’s traditional roles in society at the turn of the last century, as well as their impractical clothes, they were consistently discouraged to play soccer. Nevertheless, the sport flourished and, starting the 1920s, teams have been established throughout Europe and then in the United States. The sport’s global governing body is presently the International Federation of Association Football (FIFA). In present times, the main event for senior women's national soccer teams around the world is the FIFA Women's World Cup. The first trial competition organized by FIFA took place in China, in 1988, 58 years after the first men's FIFA World Cup, in 1930. The tournament was deemed a success, which led FIFA to host the Women’s World Cup as a regular event every four years. The United States women's national soccer team, which played its first game in 1985, is consistently among the best national women’s soccer team in the world. The U.S. squad has won a total of three FIFA Women's World Cups, the last time in Canada in 2015, four Olympic women's gold medals, and ten Algarve Cups. The German national team has won two Cups, while Norway and Japan each took home one title. According to the “Big Count,” a large scale survey conducted by FIFA, in 2007 there were around 265 million soccer players in the world, over 20 million of which were women. In 2015, the number of female players seems to have gone up, as a campaign supported by FIFA aims to increase the number of girls and women playing football worldwide from 30 to 45 million by 2019, when FIFA Women’s World Cup takes place again in France.